Posted November 11, 2014 by Treat Café in Features. 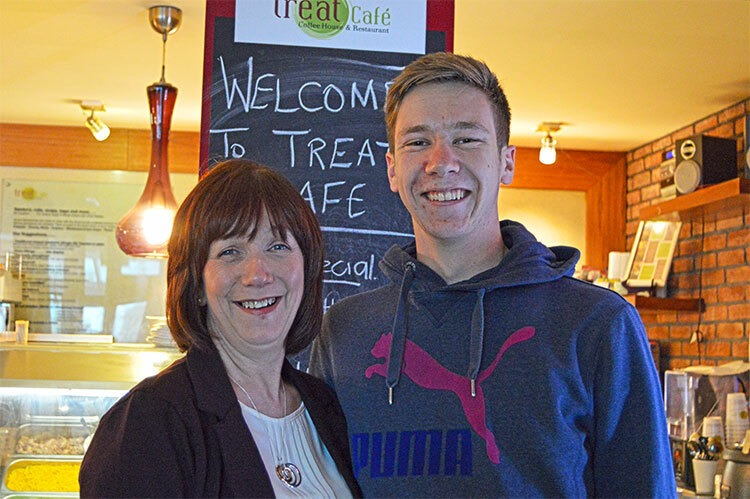 Treat Café is a local success story right here in the village of Claregalway, and more recently in Lackagh. 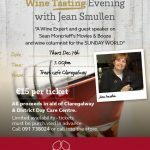 It’s hard to believe the business was set up towards the end of October 2006 at the then newly developed Claregalway Shopping Centre behind Hughes SuperValu. 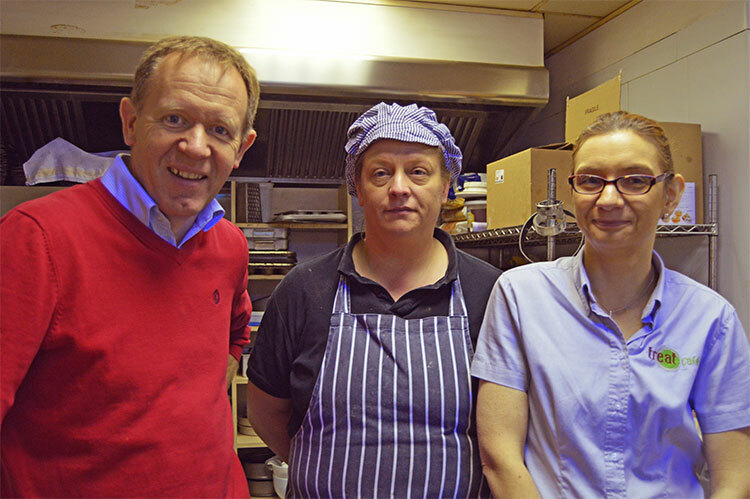 Jackie and Peadar Dolan from Cregmore (pictured above) set up Treat Café eight years ago to create a wholesome, healthy-eating alternative for people living in the area. Their goal was to provide a wide menu choice of home-style cooking using locally sourced produce and served in a warm inviting atmosphere—a place where you could bring your family, friends, business colleague, or just yourself and feel relaxed. The mission was to avoid the dreaded additives and preservatives as much as possible and to make everything on the menu from scratch. This also has applied to the majority of treats at Treat, where all the cakes and goodies like the “to-die-for almond bakes” are made on-site by Baker Fionnuala. 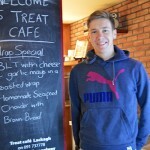 The team at Treat Café and its popular catering business now numbers some thirty people, a thriving local enterprise from small beginnings of just five people in February 2007. It’s all the more amazing when you consider the business literally rose from the ashes in January 2010 after a catastrophic fire destroyed the premises in October 2009 forcing its closure for almost four months. 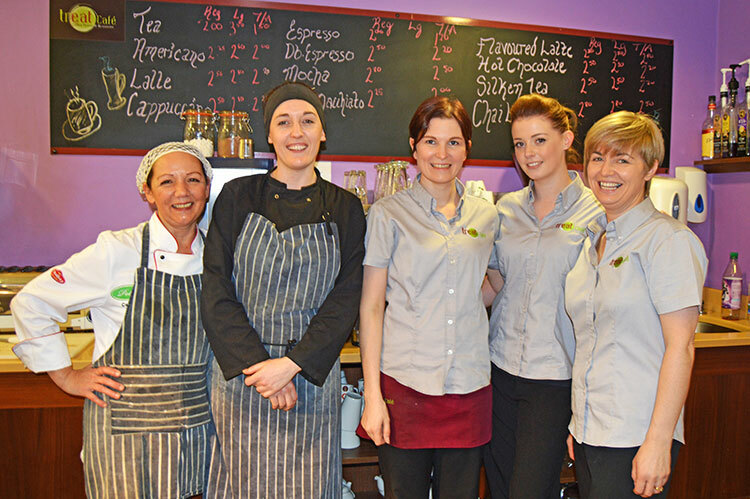 Some of the team in Treat Café Claregalway—Declan, Anne-Marie, Kapi, Evelina, Elizabeth and Joanne. 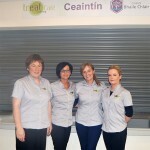 Some of the team in Treat Café Lackagh— Delia Tobin, Kathleen Meehan, Pauline Keaveny, Michelle McDermott, Marion Keane. Maureen from Tuam, a regular, chimes in, “I would travel twenty miles for the brown bread” and she does! 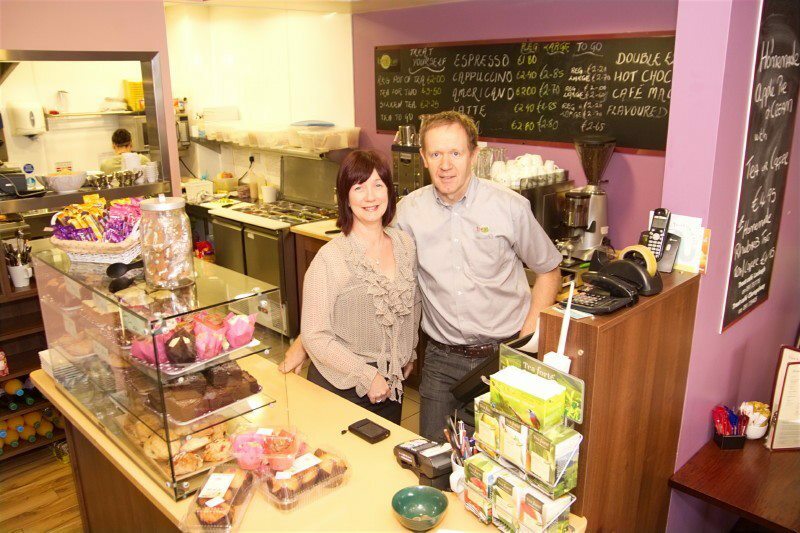 “Yes, I love lunch, but the coffee is definitely the best on the N17!” Treat are supplied by Jim and Mary from The Coffee Company in Tuam for the past eight years and the last three in the Café at Lackagh, who provide the Puro Fairtrade coffee that is loved by customers at Treat. 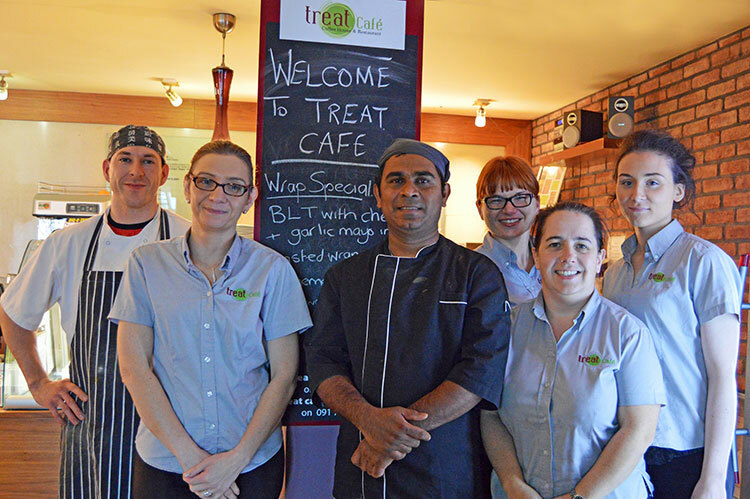 When you walk through the door at Treat, as a regular or first timer, you are sure to receive a warm greeting from the crew in Lackagh—Marian, Pauline, Niamh or Emma—and immediately get that relaxed atmosphere that Jackie and Peadar set out to create. 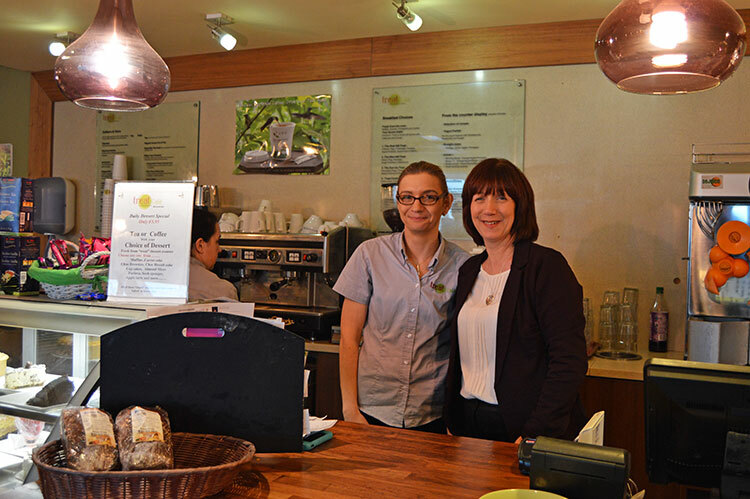 Coffees and teas are always handed over with a smile from Evelina, Martha or Joanne, and the food is prepared by Kapi, the Head Chef, who has steered the food operation from the kitchens at Treat for the last five years. In a world where diet and choice are becoming more and more important, gluten-free, vegetarian and coeliac-friendly dishes are all available at Treat. Jackie notes that Treat’s trademark soups are gluten-free and with thanks to local vegetable suppliers Glynns of Lydacan—who deliver every morning at 6am—it is possible to make it fresh daily. Visiting Treat Lackagh on a busy Wednesday morning, it was unusual to see a dominantly male clientele. On asking one of the customers John, a local tradesman, he revealed he was there to enjoy the Real AM Treat, one of Treat’s signature breakfasts, which is certainly the real deal. 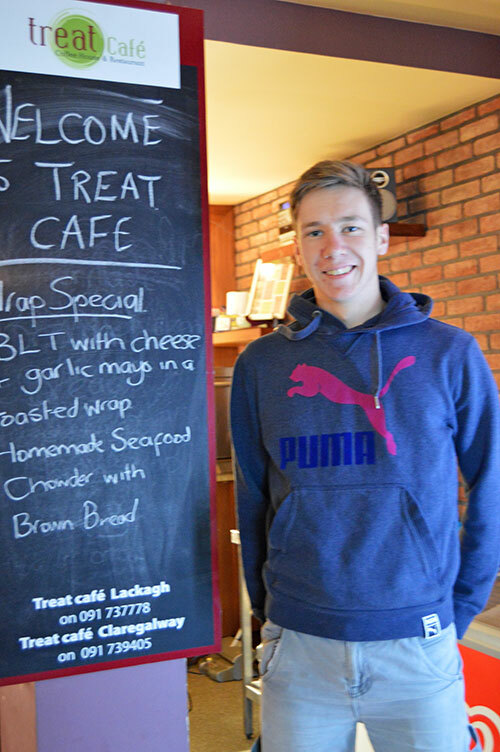 As well as managing the cafés in Claregalway and Lackagh, over the years Treat Café has also developed an extensive catering service, where they provide a full-meal service for all types of events from parties to christenings and communions or indeed any occasion. There is an extensive menu of starters, mains and dessert options available to order. Just this year they have catered for weddings and many large local club gatherings. Treat Catering went through an exciting development in 2013 when they won the contract to supply a full catering service at Coláiste Bhaile Chláir, where they provide an exclusive, healthy option for all students with full meals available every day. Indeed, they have more recently progressed to providing a similar service at the new Coláiste Mhuirlinne Secondary School in Doughiska. Jackie Dolan with her son Andrew. When you see the work it has taken to build this local enterprise, it is hard to fathom the amount of hours that must have been put in. 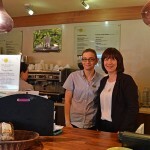 It is certainly a business that calls on the community to come and sample the delight that is Treat Café. From humble beginnings, it is fair to say Treat has achieved great progression in spite of the recession and has delivered with great consistency over the last eight years, weaving itself into the fabric of the community. Why not pop in during the run up to Christmas in either Claregalway or Lackagh, and invite a friend for a treat at Treat! Treat Café, with kitchens in Claregalway behind Hughes SuperValu, and Lackagh beside Flynn’s SuperValu, is open Monday–Saturday from 8:30am–6pm and Sunday from 10am–4pm. 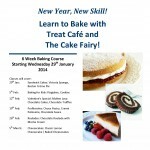 For more information, contact Lackagh on 091 737 778 or Claregalway on 091 739 405. 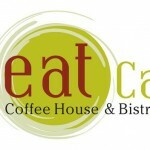 Don’t forget to like Treat Café and Restaurant on Facebook. Andrew Dolan welcoming you to the Café. School Canteen team in Coláiste Bhaile Chláir: Majella, Clare, Noeleen and Linda.